UPDATE!!! 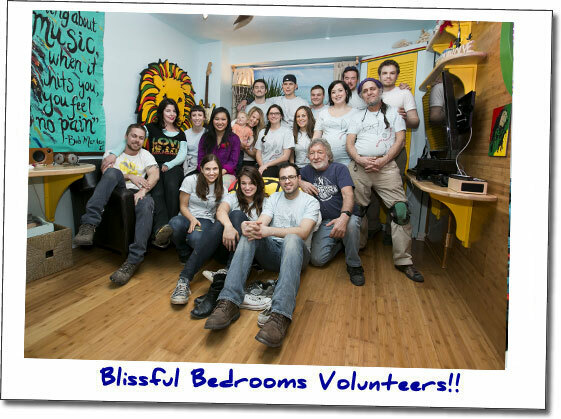 During the weekend of 2/28-3/2/14, a team of Blissful Bedrooms volunteers –TEAM NIKOLYE– made a dream come true for Nikolye. So many wonderful people invested in this charitable endeavor – NIKOLYE’S ANGELS – making it all possible. Thank you Team Nikolye and Nikolye’s Angels for opening your hearts to this beautiful young man. Together, we have forever changed his life with this act of compassion and he has definitely changed ours. Nikolye’s team was composed of a diverse group of more than 30 individuals with incredible talent and ginormous, compassionate hearts! Most everything in Nikolye’s Blissful Bedroom was handcrafted and was inspired by and made especially for this very special young man – from the custom-crafted, powerful and regal Lion headboard, which is composed of nearly 80 pieces of birch wood that were individually sanded, painted and glued, to the giant Peace Sign, which was meticulously built and wired with colorful LED lights, to the wheelchair accessible computer desk and the entertainment center shelves, to the fantastic original art work that is displayed on the walls and shelves. Nikolye’s substantial and colorful Bob Marley wall mural was created on a sunny winter day in a NYC park and emulates his vibrant and joyful nature to a T. A handcrafted floor lamp made out of a wooden drum and vinyl records stands proudly next to a custom crafted corner closet trimmed with the Bob Marley colors inside and out, which was designed creatively and expertly for form and function. So many artistic details fill every corner of Nikolye’s bedroom and even hang from the ceiling, as in the wooden peace mobile and the sleek coconut shell fan. A guitar, hand painted in the Jamaican flag colors (and autographed by every member of Team Nikolye on the back), complements the inside surface of Nikolye’s hand painted bedroom door. Nikolye’s name is hand scrolled and adorned with three little birds (inspired by one of Bob Marley’s most popular songs) and a medley of music notes made by the same carpenter artist is mounted on the outside of Nikolye’s bedroom door and allude to the harmony and good vibes guests will encounter once inside. Even the window shade, which brings the Caribbean sea to Nikolye’s bedroom, was custom printed from a personal travel photograph. Many, many other special elements abound in Nikolye’s sanctuary – each and every piece deserving a write-up of it’s own! 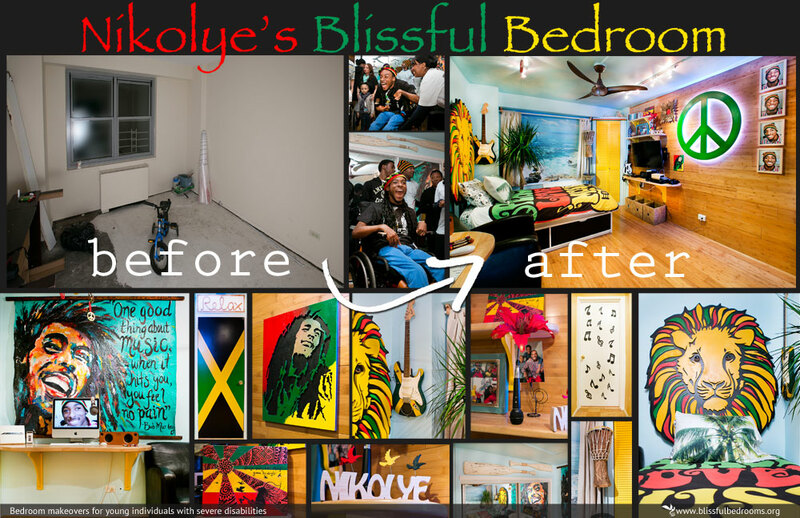 The love and energy that went into manifesting this beautiful Reggae/Bob Marley/Jamaican themed bedroom for Nikolye will resonate within the walls of Nikolye’s home for many years to come, as well as in the hearts and psyche of every single person who helped make it happen and witnessed it’s evolution. Infinite gratitude and esteem to Team Nikolye and Nikolye’s Angels for without your contribution of time and funds, this would never be. Much respect and appreciation to Nikolye’s beautiful and gracious parents, Ian and Nadine, and his handsome and honorable brothers, Edjahton and Jahyan, for welcoming us into their home, surrendering their privacy and comfort for several days, trusting in Team Nikolye’s every move, and allowing us the privilege of carrying out this act of love for Nikolye. The entire team was moved, inspired and warmed by the genuine love this family shares for each other and we are proud and happy to welcome them all to our Blissful Bedrooms Family! Nikolye, our wish for you: may all of your days be blissful in your Blissful Bedroom. Nikolye is a glowing and cheerful 18-year-old male, who has a radiant smile, and a charming and endearing demeanor. He is a strikingly handsome young man with his strong, angular features, captivating eyes and “Hollywood” smile. Yet, he has a purity and innocence about him that when combined with his beautiful face, and unassuming character, makes him entirely irresistible. Nikolye is an expressive individual and is very open and animated about showing his joy and passion, as you will quickly see from viewing his video below. Meet Nikolye! from Blissful Bedrooms on Vimeo. Nikolye currently attends a New York City Special Education school in the Bronx. He is challenged with cerebral palsy – spastic quadriplegia type, which means that both his arms and legs are affected. It is distinguishable from other forms of cerebral palsy in that those afflicted with the condition display stiff, jerky movements stemming from hypertonia of the muscles. Nikolye is dependent on his caregivers for most activities of daily living, such as bathing, grooming, dressing, toileting, and transfers into and out of his wheelchair, etc. He cannot walk, stand or sit unsupported. In the last couple of years, through therapeutic intervention at his school, Nikolye has become independent in operating a motorized wheelchair. This has brought a lot more freedom and self-worth to his life as he presently can navigate the school hallways without having someone push him. He has very good fine motor control of his hands and this enables him to eat independently, use a computer keyboard, mouse and touch screen, play video games, operate remote controls, joysticks and switches, etc. To say Nikolye is extremely excited about his upcoming bedroom makeover is an understatement. He has patiently been waiting many months for this to happen. Nikolye’s passion is music, especially reggae! His all time favorite reggae artist is Bob Marley. When he isn’t in school, Nikolye spends the great majority of his time at home watching music videos. Like most young adults, he enjoys Facebook. Nikolye also relishes good food and he loves parties and social gatherings. Wait until he experiences the Reveal Party that we will hold in his honor at the end of the makeover weekend! When we explored the theme for Nikolye’s bedroom, he decided upon a Jamaican/Reggae Music Studio motif. The bottom line is, he wants his sanctuary to be a relaxing, Jamaican oasis where he can surf the internet, Facebook with friends and family, stream music, watch videos, and sing his heart out! Nikolye’s favorite colors are red, yellow, blue and green, and we will be sure to keep that in mind when designing his space. Blissful Bedrooms can’t wait to give Nikolye a beautiful bedroom that he can feel peaceful, inspired and blissed out in for years and years to come. The Blissful Bedrooms volunteers, aka as Team Nikolye, have their work cut out for them but we are totally up for the job and we won’t stop until we see the awe-struck look on Nikolye’s face when we show him his brand new bedroom. Won’t you please help us light up Nikolye’s world! Please donate whatever you can via the Paypal button below so we can manifest his wishes and desires. If you would like to contribute in any other way, please reach out and join Team Nikolye. Thank you! Thank you to all of the beautiful volunteers – TEAM NIKOLYE - who dedicated their hearts, shared their talents, devoted countless hours to Nikolye's happiness and went above and beyond to make his special weekend perfect! Thank you to all of the generous ORGANIZATIONS/ BUSINESSES and INDIVIDUALS - NIKOLYE'S ANGELS - who supported Nikolye’s bedroom makeover by donating funds, services, food and/or materials. This makeover could not have been possible without your help! Thank you to the Companies and Individuals who have adopted Blissful Bedrooms donation boxes, and to the generous and giving customers/people who contributed to the boxes. You helped us manifest Alberto’s dream bedroom!